Although this manual is self-contained, it can be used as a supplementary resource for the “Principles of Econometrics” textbook by Carter Hill, William Griffiths and Guay Lim, 4-th edition (Hill, Griffiths, and Lim 2011). This brief introduction to R does not intend to be exhaustive, but to cover the minimum material used in this book. Please refer to the R documentation and to many other resuorces for additional information. For beginners, I would recommend (Lander 2013). A typical RStudio Screen is divided in four quadrants, as Figure 1.1 shows. The NW quadrant is for writing your script and for viewing data. You may start your script with a comment showing a title and a brief description of what the script does. A “comment” line starts with the hash character (#). Comments can be inserted anywhere in the script, even in line with code, but what follows the hash character to the end of the line will be disregarded by R.
Code lines may be continued on the next line with no special character to announce a line continuation. However, code will be continued on the next line only if the previous line ends in a way that requires continuation, for instance with a comma or unclosed brackets. When you want to run a certain line of code, place the cursor anywhere on the line and press Ctrl+Enter; if you want to run a sequence of several code lines, select the respective sequence and press Ctrl+Enter. While it is always advisable to work in the script mode because it can be saved and re-used for different data, sometimes we need to run commands that are out of the script context. Such commands can be typed at the bottom of the console at the sign >. Pressing Enter executes such a command, and the up and down arrows allow re-activating and editing older lines of code that had been previously typed into the console. To open a data file for the Principles of Econometrics textbook, (Hill, Griffiths, and Lim 2011), first check if the devtools package is installed. If it is not, run the code install.packages("devtools") in the console. Now, we can load and inspect a particular dataset, for example “andy.” When the dataset is available, it sould show in the Environment window (look up and right). plot(x, y, xlab="income in 100", ylab="food expenditure, in $", type="p"), where x and y stand for the variable names to be plotted, xlab and ylab are the labels you wish to see on the plot, and type refers to the style of the plot; type can be one of the following: “p” (points), “l” for lines, and “b” for both points and lines, “n” for no plot. The type value “n” creates an empty graph which seres other functions such as abline(), which is described below. 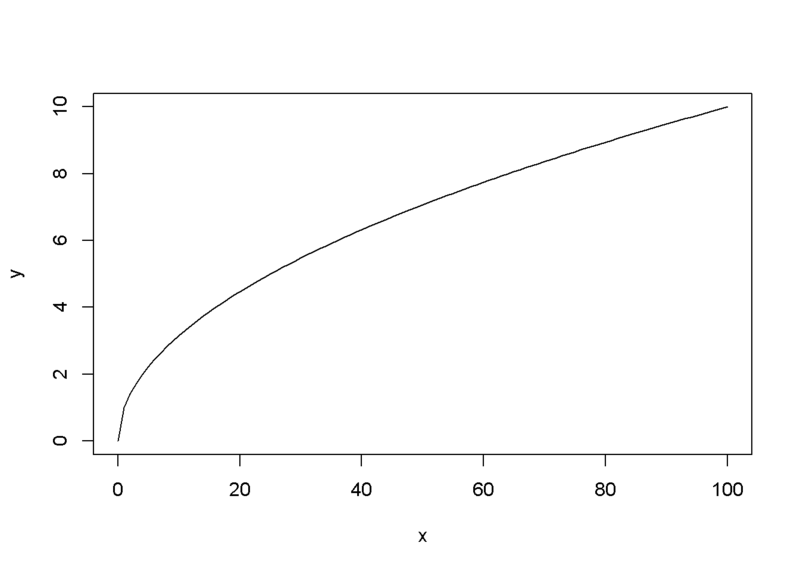 The function curve() plots a curve described by a mathematical function, say \(f\), over a specified interval . 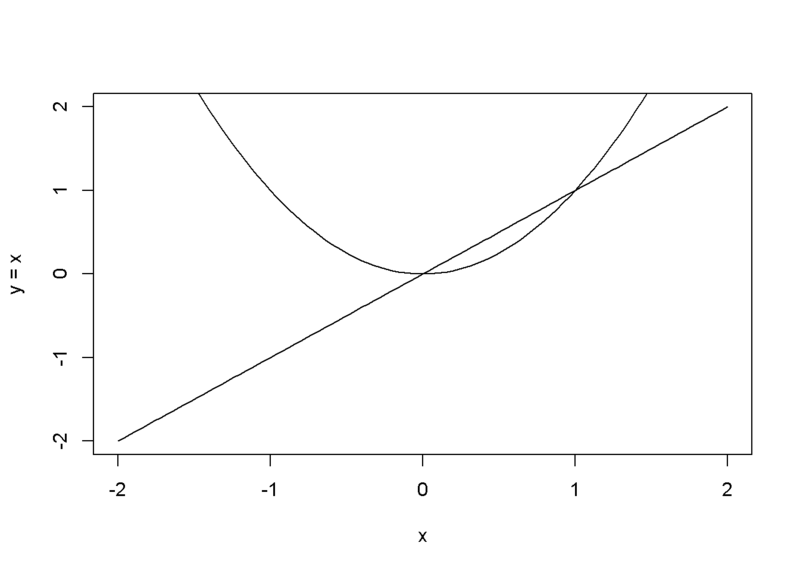 When the argument add = TRUE is present, the fuction adds the curve to a previously plotted graph. Figure 1.2 is an example. 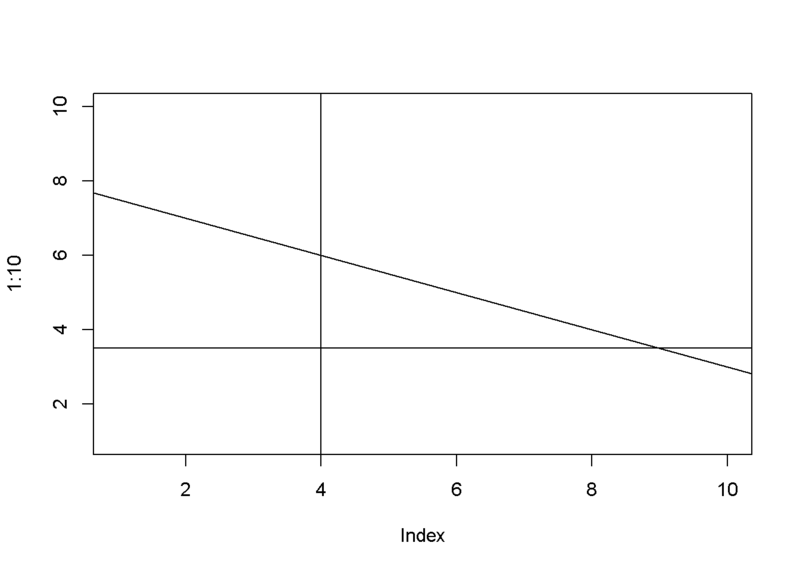 The function abline() adds a line defined by its intercept a and slope b to the current graph. 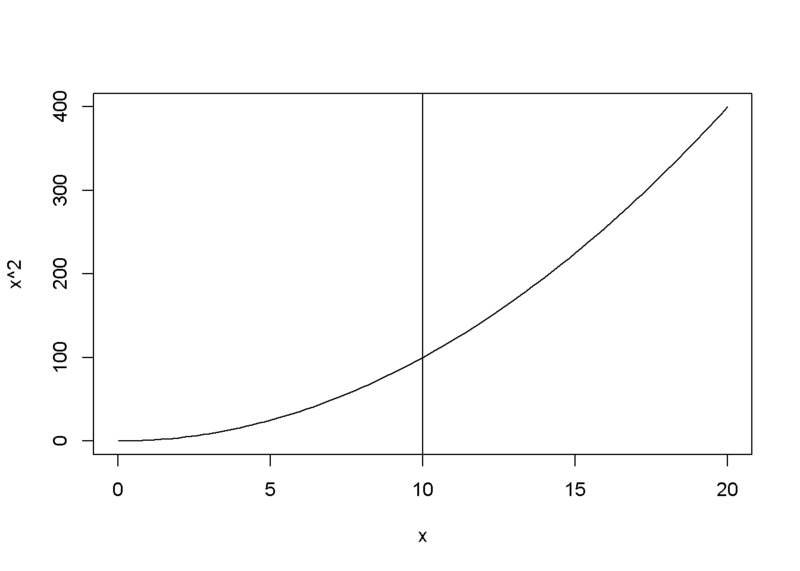 The arguments of the function are: besides a and b, the arguments of the function are: h, the \(y\)-value for a horizontal line; v, the \(x\)-value for a vertical line; coef, the name of a simple linear regression object, which includes the intercept and slope of a regression line. Here is an overview of some R commands used in this book. Xie, Yihui. 2016b. Knitr: A General-Purpose Package for Dynamic Report Generation in R. https://CRAN.R-project.org/package=knitr. Xie, Yihui. 2016a. Bookdown: Authoring Books with R Markdown. https://CRAN.R-project.org/package=bookdown.